Going through the Welland Canal is a non-trivial matter. You are required to have four people aboard. I found out since my boat was just 22' I could go through with two people so I got a friend to come down from Toronto and help me through. He drove to where I was and then took a taxi back to his car at the other end of the canal. The time to go through is not your choice - you can usually go through within 24 hours of arriving but when depends on various factors. You have to go through with commercial ships or a group of recreational boats or both. You have to be prepared to go through during the night so you must have all your lights in order. 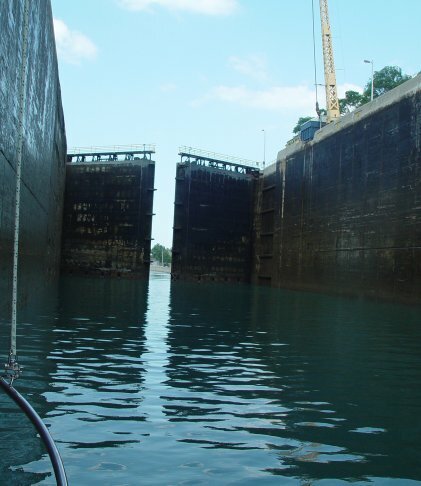 The locks are easy to traverse with little turbulence but I had one scare when a commercial ship came in pretty fast when I was already at the front of the lock and I really wondered if he would stop in time - he did - but just barely!